Bluff City Bakery Chef Jason Doty wants to help you celebrate with his original Bourbon Pecan Pie recipe. If you like the pie, go back and check out the recipe for Jason's decadent signature brownies. 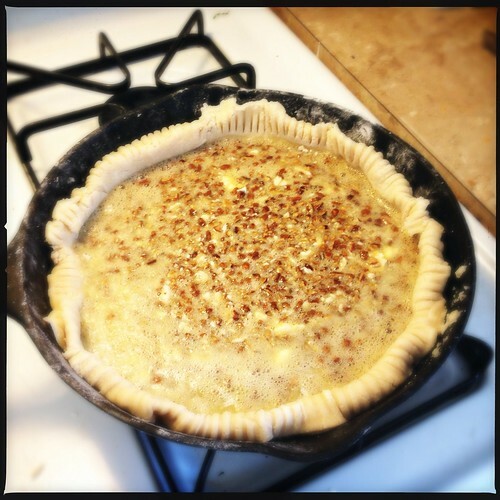 First, we'll make the crust. 1. Get your butter out of the fridge (or freezer) and come to room temperature, but still cool. 2. 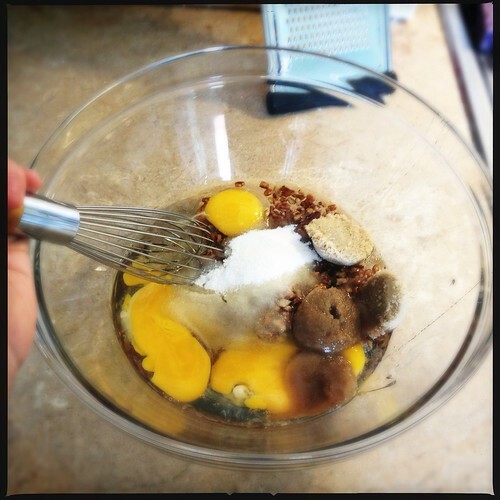 In a large bowl, mix the flour, salt and sugar. 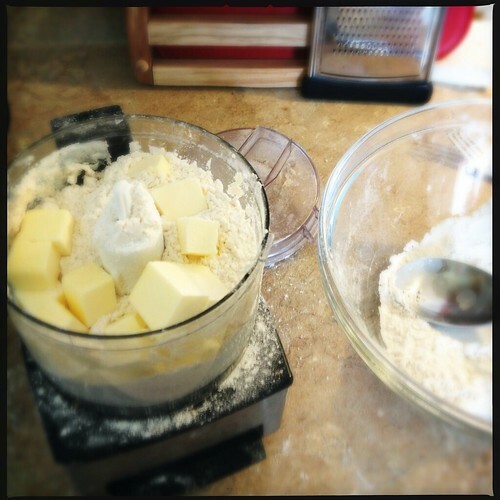 Chop the butter into half inch squares. 3. Put the dry ingredients and butter into a food processor with a blade attachment. If you don't have a food processor, you can do this part by hand. If you've got one, but it's laughably tiny like mine is, do it in batches. 4. Blend until combined. You'll know it's done when it starts to resemble pebbles of sand. 5. Slowly add the 1/2 cup of cold water and mix just until dough starts to come together. You may need to add another 1/4 cup of water, depending on your flour. 6. Remove the dough from the food processor and knead it by hand. Be careful not to overwork the dough, because if you do, it's going to be all chewy and tough, and you don't want that. 7. Spread flour on a clean, dry surface and place the dough ball in the center. 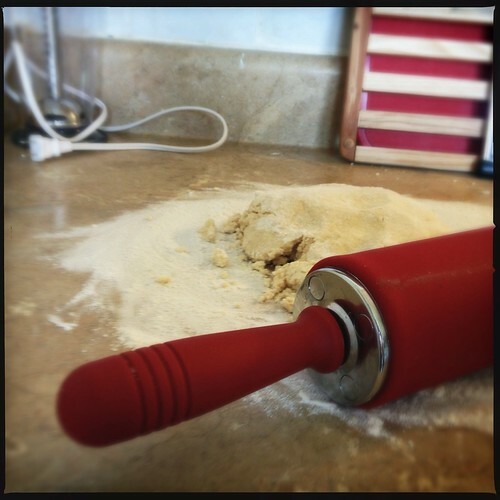 With a rolling pin, roll the dough out until it's about 1/4 inch thick. 8. Roll the dough around the rolling pin like a pinwheel so that you can transfer it to the pie pan. 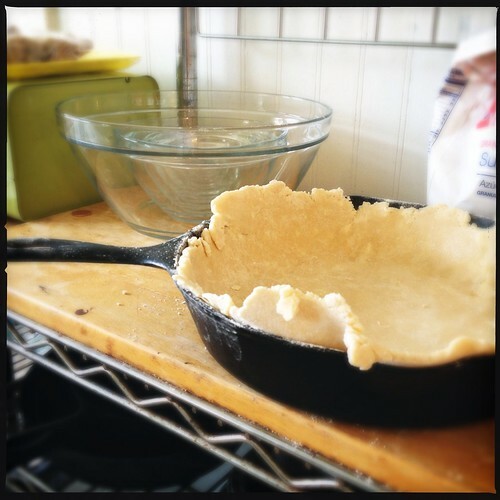 Place your pie pan on the surface and unroll the dough over the top of the pan. Gently press it into the shape of the pan and trim the edges with a sharp knife. If you're feeling fancy, use a fork to score around the edges. If you realize mid-way through the recipe that you don't have a pie pan, you can always use a cast iron skillet. Now it's time to make the filling. 1. Combine the chopped pecans, corn syrup, eggs, sugars, salt, vanilla and bourbon in a large bowl and whisk together. Melt the butter and temper into your mixture. 2. Pour the filling into the pie crust. Top it with halved pecans. 3. Put it in the oven and cook it at 350 degrees for 35 minutes. Let it cool completely before you attempt to slice it up and eat it. Hey, look! You made a pie! His brownie recipe was delicious, I can't wait to make this too. I have cooked this for 45 min and it is still runny. Any suggestions?